We now know all the occupants of Bikini Bottom! Full casting has been announced for the Broadway-aimed The SpongeBob Musical. Main Stem alum Carlos Lopez (Man of La Mancha) will play Mr. Krabs in a company that already includes Ethan Slater and Lilli Cooper. Co-conceived and directed by Tina Landau, with a book by Kyle Jarrow and music supervision by Tom Kitt, the production is scheduled to make its world premiere on June 7 at Broadway in Chicago's Oriental Theatre. We are most definitely not making any comments about Mr. Krabs hanging out in Bikini Bottom. Oh no. Along with Slater as SpongeBob SquarePants and Cooper as Sandy Cheeks, the cast will also include Gavin Lee as Squidward, Nick Blaemire as Plankton, Danny Skinner as Patrick, Gaelen Gilliland, Juliane Godfrey, Curtis Holbrook, Stephanie Hsu, Jesse JP Johnson, L’ogan J’ones, Emmy Raver-Lampman, Mark Ledbetter, Kelvin Moon Loh, Lauralyn McClelland, Vasthy Mompoint, JC Schuster, Allysa Shorte, Jacob Smith, Abby C. Smith, Jason Michael Snow and Allan K. Washington. Stakes are higher than ever before as SpongeBob and all of Bikini Bottom face the total annihilation of their undersea world. Chaos erupts. Lives hang in the balance. And just when all hope seems lost, a most unexpected hero rises up and takes center stage. Get ready to dive to all-new depths of theatrical innovation at The SpongeBob Musical, where the power of optimism really can save the world! 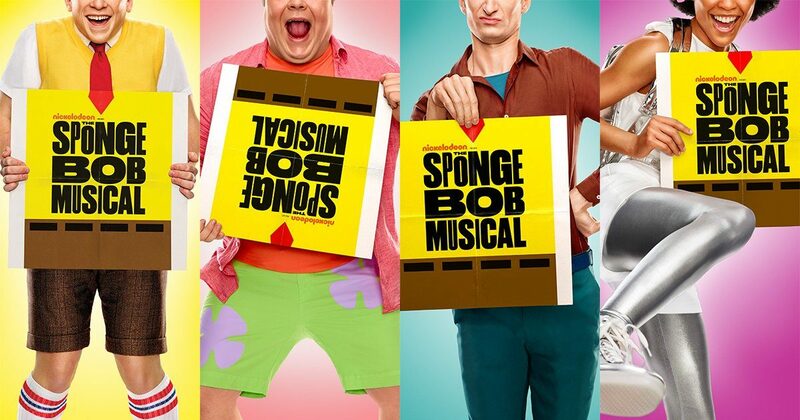 The SpongeBob Musical will feature original songs by Yolanda Adams, Steven Tyler and Joe Perry of Aerosmith, Sara Bareilles, Jonathan Coulton, Dirty Projectors, Alex Ebert of Edward Sharpe & The Magnetic Zeros, The Flaming Lips, John Legend, Lady Antebellum, Cyndi Lauper, Panic! At the Disco, Plain White T’s, They Might Be Giants and T.I., and a song by David Bowie with additional lyrics by Jonathan Coulton.